This 2010 vintage was distilled from grain grown in 2008 by Gilbie McCormick of Claggan, Hunter Jackson at Cruach, Ian McKerrell of Island and Alastair Torrance from Mulindry. CHARACTER - Great structure. Firm, muscular and more complex than expected. Several layers of flavor are melding into a barley sugar and oak mellowed texture while drifting over sweet kiln-dried barley. The senses are singing with joy as it zings over the palate leaving no doubt as to the island of its birth. NOSE - The opening notes are of soft, really ripe gooseberries, fresh pineapple and mango. It is harvest time in a global orchard, sweet red apple, plump green grapes and even a hint of peach. It is a brilliant opening leading you further into the garden where you can enjoy the harmonious aromas of carnations, mimosa and mint. night scented stocks and lilies drift on a mid-summer breeze, continuing through the golden fields of islay barley. This is a Hebridean journey like no other, but wait, the sweetest vanilla notes are emerging with hints of spicy bourbon and a touch of toasted oak. dark plums appear with dates and that oloroso richness that only Jerez casks can provide. PALATE - The taste is directed. Malty sweet, cereal, honey, clean and citrus fresh. A stunning example of how trickle distillation using victorian equipment and 134 years of practice can produce a young spirit that needs not the weight of oak to shine. This sensational succulent young spirit offers candied almonds, hints of toffee apple, nougat wafers, banana, ginger biscuits and sherried sponge. It is a tale of two cities. 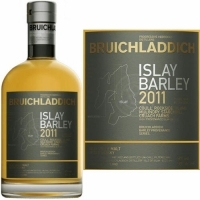 On the nose the floral aromatics were an Islay welcome to a beautiful marriage of ancient ozark oak and young Islay Barley. FINISH - Enjoy the invitation of an island's warmth and the sincerity of its people, its history and its future. You are now one of our family. Welcome. MOOD - It is the perfect welcome home dram at the end of a hard day. You have given your best so you are entitled to drink the best. Because you can.